Still Meadow is tucked away back behind the Carrsbrook neighborhood. It might be hidden but you’ll be delighted when you find it. Homes in that neighborhood were built in the late 1990’s and early 2000’s. Price start around $500,000. There is also a community pool and tennis courts and trails that lead down to the Rivanna River. 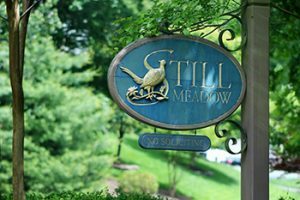 The location is one of the best things about Still Meadow. You are just a short ride to Fashion Square Mall and you can be downtown in 10 minutes.